Ready to launch your non-clinical physical therapy career? We have the non-clinical job resources you need, including discounts and course recommendations. These are products and services that can help you grow your non-clinical career! I only recommend what I truly believe in, but if you know of anything you feel I should add, I’d love to learn more…so please reach out! I’m also launching a review series soon, so you’ll be able to read about all of these products and services much more in depth. Affiliate Disclaimer: I have established relationships with some of my favorite trusted companies. By using several of the links below, you’ll help support the mission of The Non-Clinical PT, but in no way does it increase the cost you pay for these items and services. My goal is always to get a discount or special offer for you with any affiliate partnership! Thank you for your support! Learn how to use your degree and experience in fun, fulfilling, high-paying non-clinical jobs! Non-Clinical 101 is available now! 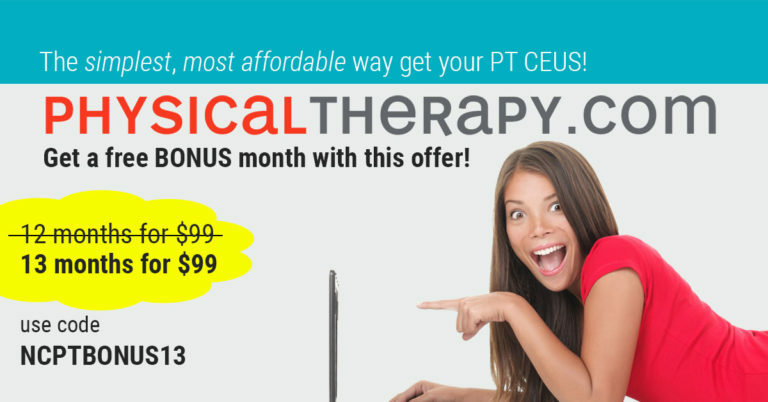 Get UNLIMITED CEUs for Just $99 year....PLUS a Month FREE! Save money and get unlimited CEUs in as little time as possible! PhysicalTherapy.com is the simplest, most affordable option for online CEUs. Read why I recommend it. Get a free month when you subscribe by using code NCPTBONUS13 at checkout. Use the same code for the same deal at OccupationalTherapy.com and SpeechPathology.com! Get unlimited CEUs and access the largest selection of non-clinical rehab courses online! Check out the certification tracks in ethics, research, leadership, and palliative care. Be sure to use the discount code nonclinicalPT at checkout to save on your membership. Learn real tactics to be successful in the health writing industry! 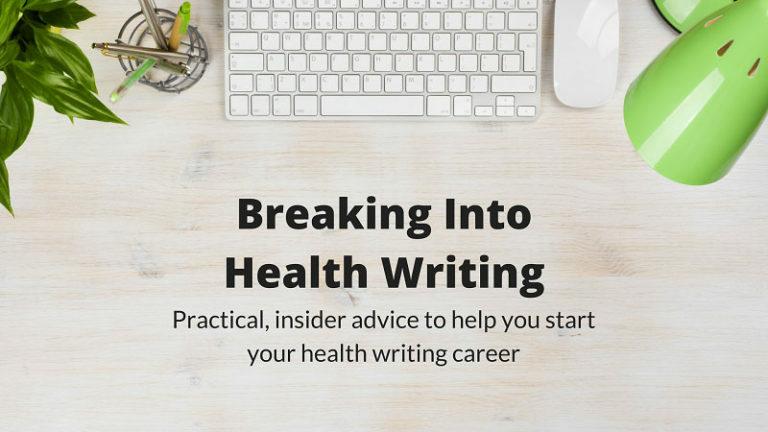 This is, hands down, the best introductory course I have found for aspiring health writers! Be sure to enter the code TNPT at checkout to get 10% off! Learn marketable tech and business skills by taking courses developed by the experts...without paying a fortune! Skillshare is an extremely affordable way to learn design, business, and tech skills that you can add to the skills section on your resume. These skills can help you land content marketing, UX/UI, account management, and business development jobs. Launch your own profitable telehealth business with confidence! Rob Vining, PT, MSPT is the go-to resource for all things telehealth, and he offers consulting to help you set up your own profitable teletherapy business. With code nonclinicalPT, you’ll save $50 on two hours of time with the best teletherapy resource there is! Earn CEUs while you fight burnout...without leaving the clinic! Burnout is real, and it drives many of us far away from patient care. But if you LOVE treating patients and want to keep doing it––or have to keep doing it––this course teaches real, usable strategies to fight burnout before it takes over your life. Be sure to enter the code nonclinical at checkout to get $10 off! Create your own online business! People are constantly asking me what I used to create The Non-Clinical PT, so I put together this resource where you can find everything from the platform I use, to the theme, the pop-ups, where I get my photos, and even who I use for my email provider! Several times each week, I post a number of curated non-clinical jobs located across the U.S. I list the location (some are remote! ), job title, and license required, and I try to include pay when possible. This is a great group to network with other non-clinical rehabilitation professionals (yes, that includes, OTs, SLPs, and assistants! ), and I pop in several times per week to offer free advice and recommendations. This book is phenomenal for anyone making a career change. It is packed with actionable tips, and it is both empowering and inspiring. If you’re feeling bad for changing course, this is the book you need to read. You’ll feel energized and excited for what’s next! This one’s for the ladies! Even though it’s directed toward women, Playing Big is a phenomenal read for anyone who has the tendency to self-sabotage (and I’m pretty sure that means everyone). This is the best self-help book I’ve ever read, and I highly recommend it for anyone seeking the courage to pursue their dreams. This book is exceptional for people who can’t seem to get started or stay motivated. I’m guilty of both, and The Slight Edge taught me that it’s OK to take small steps toward my goals, as long as I’m doing something. Microsteps are better than no steps at all!